Optical Image Stabilizer with A.I.S. The JVC GC-PX100 Full HD Everio Camcorder captures Full HD 1920 x 1080 video and up to 12 Mp still images. It can record Full HD video and 3 Mp still images simultaneously as well. It features an SD / SDHC / SDXC memory card slot, a back-illuminated 1/2.3" 12.8 Mp CMOS image sensor, and a wide angle F1.2 Super Bright Lens. The high-quality lens supports 10x optical zoom, 16x Dynamic zoom, and 200x digital zoom. The camcorder has a FALCONBRID engine, x.v. Color, and a 3" touch panel LCD for easy recording and instant playback. The GC-PX100 is equipped with Wi-Fi and several wireless functions, Data Transfer to tablet / smartphone / PC, One Touch Auto Backup to PC (HD compatible), Home Detection Monitoring (Auto Photo E-mail), Video E-mail, and Geotagging. You can use the camera with JVC's free downloadable apps as well. These apps include the JVC CAM Coach app, which is a tool for analyzing athletic performance. All the apps works with Android phones/tablets, iPhone, and iPad. The GC-PX100 also features several other user-friendly shooting controls and options. It's equipped with an Optical Image Stabilizer with Advanced Image Stabilizer (A.I.S.) and Super LoLux. It features Intelligent AUTO, Auto REC, high-speed continuous still recording, Zoom Position Memory, and ultra-slow motion video. Plus, it supports shooting speeds up to 600 fps for shooting high-speed action. The GC-PX100 has Face Recognition technology, Smile Meter / Smile Shot, K2 technology for audio, a zoom microphone, a mic input, a headphone jack, a built-in video light, and a photo light as well. The GC-PX100 features MediaBrowser SE software for Windows, which allows you to import and manage video files, archive your recordings to disc and export your files to iTunes for Windows. You can also use MediaBrowser SE to upload files to Facebook and YouTube. If you get done with a recording and can't wait to share it with friends and family, the GC-PX100's integrated mini HDMI output makes it possible to connect the camcorder directly to your HDTV. Once connected, you can share all your video clips on the big screen in Full HD thanks to the camera's 1080/60p video output capabilities. Box Dimensions (LxWxH) 12.3 x 6.9 x 6.5"
GC-PX100 Full HD Everio Camcorder is rated 4.1 out of 5 by 27. Rated 4 out of 5 by Don from All round good camera This camera feels great to hold onto for shooting video from many positions, thanks to the multi-angled view screen. However none of the positions face forward. Much better ergonomically than shooting video with a DSLR but still small and looks like a good tourist camera, as opposed to a pro camera. The touch screen menu is very responsive and menu layout is easy to navigate. Image quality is pretty decent for this price range and clips can nicely be modified in post colour correction. Not quite as good in low light as I expected. However the grain produced is smoother than other cameras I have. Rated 5 out of 5 by DjnanaGee from GREAT CAMCORDER, IMPRESSIVE DESIGN It was a big struggle choosing one among these 3 camcorders (Canon VXA HF 620, Panasonic HC-X900M and JVC GC-PX100) after extensive research of reviews and video postings on YOUTUBE I settled for the JVC GC-PX100 and it's the best choice and I have no regrets at all. I have given it a thorough test from picture quality, sound and low light and it rocks.The price is right and the design is slick. Rated 5 out of 5 by Dave Ross from JVC GC-PX100 Very Nice! I have DSLRs (Canon 5D and T4i) and a few cheaper consumer video cameras. This think works great. Has good low light performance. Excellent Picture quality and the slow motion/high frame-rate is FUN!!!! Someday Moore's law will let us have 1000fps at HD and 4K (Like the Phantoms) cheaply, but this is great fun and not too costly. This camera will become the home video workhorse. We use Macs and this guy is Mac friendly. 1080p at 60fps is the norm!!! Great job JVC!!!! Also use your iPad and WIFI for a great monitor!! Rated 2 out of 5 by Geo from Audio Control Lacking I was so excited to buy this camcorder. It has so many fantastic things going for it! As an audiophile, I was extremely happy to see the standard size hot shoe right on top (so few consumer camcorders have them anymore) AND the ability to record in straight PCM. That's awesome. But then I dug a little deeper and saw it doesn't have full manual audio level control. Only presets: 0, -1, -2. That's not going to cut it when recording loud music. WHAT WERE THEY THINKING? With all the other fantastic features, and considering it's a $1K camera, I can't believe they cheaped the manual audio gain. Until they fix that, I'm afraid I can't buy this camcorder. Rated 4 out of 5 by JoeStyle8 from Supplement to my DSLRs Having used DSLRs for a while, I missed having motorized zoom and not have the aperture step down hard as you zoom in, the exposure maintains throughout the zoom when manually setting the aperture to f/2.8, very nice and fast. Also no visible chromatic abberation, you do get it wide open.Other issue I had with DSLRs was the audio, I did hack my 60D and T2i to disable AGC, but wasn't happy with over all quality of audio, despite all my testing. This camera addreses that issue, high quality audio recording when paired with good shotgun mic or wireless system.Timelapse- I do plenty of. Having a mirror-less camera do capture timelapse as oppose to having my DSLRs shoot thousands of shots for a 10-20 sec playback wasn't going to work in the long run. Shutter actuations will eventuallly reach it's max and DSLR is dead. So this camera again satisfies my needs to have mirror less timelapse with manual exposure settings. The unique look - I didn't want to buy a handycam looking equipment next to my DSLRs. Even at this price range, there are no camera out there that looks semi-professional. However, this is a tiny camera, so accesorizing will turn this into a beast looking thing.The manual control buttons for focus/exposure are also one of my must have feature. As a DSLR shooter, I became accustomed to it. Also an an easy transition of using this from DSLRs. Continious recording - DSLRs have those 12min max limits. So this camera fill the gap and becomes my cover shot perfect for events that require continues footage. It also makes editing much easier since I have something to fall back on while DSLRs capturing b-rolls and more filmic shots.Dynamic Range: Seems to clip much fast in the highlights, I attached a ND Fader to lower exposure just enough to remove zebra stripes, while maintaining 180 degree shutter @ f/2.8 then just slightly increase shadows/midtones in post.Bitrate: Pretty darn good, not nearly as DSLR's bitrate but higher than other cameras in this price range.HDMI output: Attaching a very nice feature to have HDMI only show the picture, without all the other camera display info, just your picture. Perfect for doing interviews and greatly helps with focusing and for anyone also needing to observe what you're seeing. Wifi - Needs some improvement but not completely useless. Camera has wifi antenna and can send its own wifi hotspot for your mobile device to connect. A little gimmicky, but the nice thing is, when you want to upload remotely via phone but use the camera to capture the action, then this is the solution. Also good for discreet filming, using the iPhone as a monitor. There is a delay during actual recording, but plays realtime once you download wireless from camera to phone, or view it from the camera itself.Overall, I'm very pleased with this camera, I knew the shortcomings upon purchasing it, I can only hope that JVC will release a firmware that will completely address some of the issues to make this a complete FlagShip camera. Here's my wish list:#1: Enable 24p#2: 120fps @ 720p#3: Color/Face Focus tracking on Manual mode#4: Zoom Focus Assist (maybe hold down MF for 2 sec to activate it? )#5: 1,2,3 sec shutter speed#6: Wifi U-Stream#7: Enable hotspot via mobile device to stream remotely on-location, #8: Make top Menu screen, the Camera settings screen. (quicker access to comon controls)If only one could be achieved, atleast make 720p recording for 120/240 fps. Rated 5 out of 5 by Jim the Art Director from Great Camcorder This is an extremely useful tool for making quick and easy pro quality video. Instant playback on the touch screen and the thumb dial frame speed control are my favorite features. Zoom button is intuitive and allows a slower zoom if desired. Takes a little practice to get some great results. 600 fps slow motion is very smooth, but at a smaller screen resolution. Using the 240 fps seems to be the sweet spot. All-in-all very happy with this product. Rated 5 out of 5 by Best Sports Biomechanist from Great camcorder for professionals I am a sports biomechanist working with elite athletes. We use this camcorder for quantitative movement analysis. This camcorder has everything we need, and so easy to operate. It has many features and accessaries PX10 does not have. The design is better than PX10. Little bit disappointed that it does not have a hard drive as PX10 does. Also, I noticed that PX100 does not automatically set the zoom as it had when turned if AC power is connected. You have to push a button on the screen to get the zoom back. These are all minor things. No big deal. Overall it is a great camcorder for professional movement analysis. Some important feastures like shutter speed are not listed in specifications. It is strange. Does this camera have the ability to playback with time and date on screen? A time/date stamp is not an available feature of this camera. This product is listed with Audio Input : Yes. What type of audio input is it and how would I be able to use a line in? This camcorder offers a microphone input on a 3.5mm (1/8 mini) port. 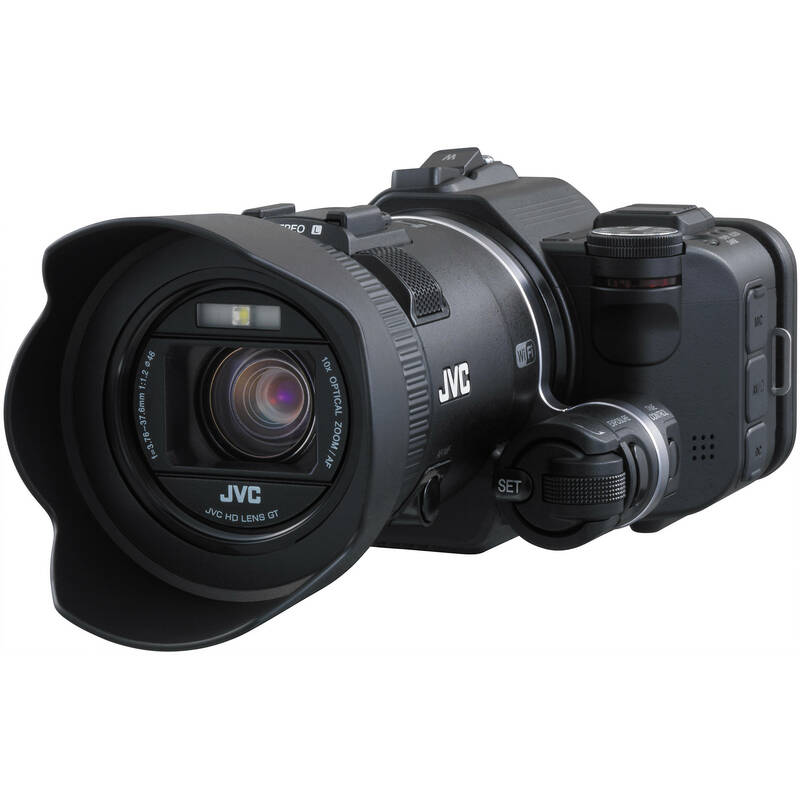 Is this the GC-PX100B Procision Full HD Camcorder current model for JVC? It doesn't have the 100 B in the name. I'm interested in the Camcorder for use in capturing videos of moving trains. I just returned a Sony Handycam because it would not capture a train without visible blurring. The ground, track, rails etc (non-moving objects) where crystal clear but the train itself was always blurred. Can this camera take a video of a moving train without it being blurry? When shooting video each individual video frame must have some blurring to offer a pleasing sense of movement when the frames are played back in a continuous stream. This JVC camcorder will shoot action with your moving subject with far less blur than camcorders that can only shoot at 30 or 60 fps. Try using the 640 x 360 / 300 fps setting. I would like to use this camera in a studio setting, does it have the ability to turn off the display info.? Yes, you can cycle off the informational display on the camera's screen and on an attached monitor. Does the JVC GC-PX 100 comes with an attached view finder as well? I love this camera. It is great for make movies and photos. I am thinking about buying another one. It had take a while to learn the system but I love it. Do this new jvc procision camera have a after market tripod it can be mounted too?